For other places with the same name, see Błonie (disambiguation). 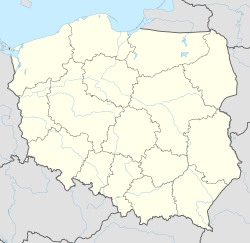 Błonie [ˈbwɔɲe] is a town in Warsaw West County, Masovian Voivodeship, Poland, with 12,191 inhabitants (2004). The town of Błonie was first mentioned in the 11th century, and already in the 12th century constituted a sizeable settlement with the first church founded in 1257 by the Prince Konrad II of Masovia. The church built in the Early Gothic style exists to this day, although rebuilt several times. The city rights were granted to Błonie by Prince Władysław of Krakow on 2 May 1338. During the Nazi German invasion of Poland at the onset of World War II, the unit of Leibstandarte SS Adolf Hitler murdered 50 civilians (mostly Jews) on the outskirts of Błonie in a single mass execution, on (pl) of 18 September 1939. German authorities established a Jewish ghetto in Błonie in December 1940, in order to confine the Jewish population of the town for the purpose of persecution, terror, and exploitation. The ghetto was liquidated in February 1941, when all its remaining 2,100 Jewish inhabitants were transported aboard the Holocaust train to the Warsaw Ghetto, the largest ghetto in all of Nazi occupied Europe with over 400,000 Jews crammed into an area of 1.3 square miles (3.4 km2), or 7.2 persons per room. By the time Nazi-occupied Poland was liberated, not a single Jewish ghetto remained. Błonie railway station, opened in 1902 on the Warsaw–Kalisz Railway, is served by Koleje Mazowieckie, who run services between Kutno and Warszawa Wschodnia. ^ The statistical data compiled on the basis of "Glossary of 2,077 Jewish towns in Poland" Archived 2016-02-08 at the Wayback Machine by Virtual Shtetl Museum of the History of the Polish Jews (in English), as well as "Getta Żydowskie," by Gedeon, (in Polish) and "Ghetto List" by Michael Peters at www.deathcamps.org/occupation/ghettolist.htm (in English). Accessed July 12, 2011. ^ "The War Against The Jews." The Holocaust Chronicle, 2009. Chicago, Il. Accessed June 21, 2011. ^ Richard C. Lukas, Out of the Inferno: Poles Remember the Holocaust, University Press of Kentucky 1989 - 201 pages. Page 13; also in Richard C. Lukas, The Forgotten Holocaust: The Poles Under German Occupation, 1939-1944, University Press of Kentucky, 1986, Google Print, p.13. ^ Gunnar S. Paulsson, "The Rescue of Jews by Non-Jews in Nazi-Occupied Poland," Journal of Holocaust Education, Vol.7, Nos.1&2, 1998, pp.19-44. Published by Frank Cass, London. ^ Edward Victor, "Ghettos and Other Jewish Communities." Judaica Philatelic. Accessed June 20, 2011. This page was last edited on 7 June 2018, at 15:39 (UTC).